Ok, this is one of the many cultural challenges I didn't even know I was facing when I moved to Australia: first, having a Queen at all; second, not being a republic (really?? ), and third, the liberties that are taken with the Queen's Birthday holiday, which is on a different day in almost every state, none of which correspond to her real birthday on April 21. Nevertheless, it was a reasonable day for shepherding, compared with the weekend. Though the threatened thunderstorms and hail did not eventuate, wet snow and gale-force winds combined with freezing temperatures to make it a most unpleasant Saturday anywhere except in front of the fire. I got lots of cooking and knitting done! Sunday was better, but overcast and windy, and still pretty cold, so I stayed in again. I set off this morning in good fettle, and only made it as far as the main yards--about 200m--when my ankle locked up on me and I could only just hobble back to the house. I did a bit of massage and yoga work on it, and got it moving enough to continue the circuit using the Polaris. I really don't like using the Polaris--it throws the whole balance of shepherding out of whack. I can't be where I want to be, and I struggle to keep an eye on the flock and the dogs. Happily, the sheep were willing to follow me in the buggy this morning--first time ever (P1, P2). I think they were pretty tired of grazing lucerne. Whatever the reason, it was fairly easy to get them out of the Lucerne Reserve. We then did a circuit around the two paddocks in the burn area--first time for the southern one (P3) since the January fire. They really put their heads down and enjoyed the long, mature, but still fresh, grass. While they were grazing there, I took a quick trip up the hill to make sure I hadn't left any sheep behind in the top of the Lucerne Reserve. From the top of the hill, I got a good shot of a frequent winter phenomenon here: the Red Rocks Jerry (P4). Red Rocks is the local name for the saddle leading out of the Oatlands valley to the north, and a "jerry" in this context is cold, dense airflow constrained by topography and driven by density differences, rather than large scale pressure cells. (The big sandstorms you see in movies of the Sahara are similar density-driven flows, where the sand contributes to the density gradient.) Jerries can be locally very strong, and generally bitingly cold. Happily for me, the Red Rocks Jerry seldom fills the whole valley, so it's mostly just a beautiful cloud formation to watch flowing southward. 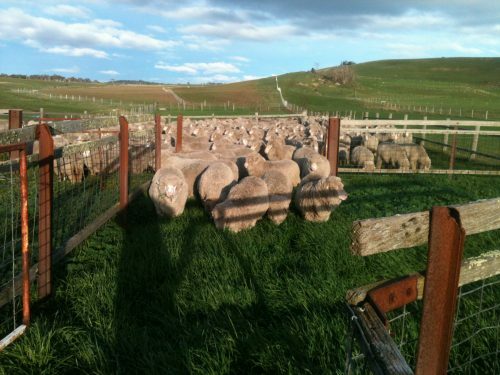 After mid-day rest (I had a nap, too, though back at the house in the warmth of the afternoon sunshine), we went for a tour of the main sheep yards, which haven't been grazed for ages, and have foot-high grass and weeds. I didn't do a particularly good job of getting them to put their heads down and graze peacefully--there was a certain reluctance to go into the yards, so when the dogs pushed them in, the sheep were a bit rattled, and didn't want to graze. Then I had competing drivers--the wind was northerly and I wanted them to go south. Got them to the southern end, when I wanted them to turn back north, but then the sun was in their eyes. Some grazing did happen, and there's always another day. Finally, they had to leap an even wider section of Curly Sedge Creek to get back into the Racecourse Grazing Area, and interestingly, Albert was right there to lead them for me again. He actually followed me out of the yards--nearly the last sheep out, then stayed with me as I made my way to the creek, and made the jump without hesitation. If anything, I think he may have found his calling as a water hazard steeplechase sheep. I took a video of the flock following Albert, but it's not an Instagram one (I took it with my phone, which is so old a model I can't install Instagram on it ;-), so I'll have to do some fiddling to get it embedded in a post--not tonight! I'm planning to take the flock around to the Stud Paddock on Wednesday. The forecast looks ok, and we may actually start to dry out a bit over the next week. P2: Following me in the Polaris near the gate out of the Lucerne Reserve. P4: The Red Rocks Jerry. Sometimes it works, and sometimes not. They followed beautifully to the gate, then took a sharp right. The dogs had to give me a hand. P5: Elf trying to find the end of my shoelace so he can untie it. Last time it took him about 10 seconds to get both my boots untied. This time, I kept moving. P6: One of the better grazing moments in the yards. You can see by my shadow they are looking into the sun--not something they like to do. I guess, just like for us, it's blinding, and makes it hard to see any lions that might be lurking in the long grass ahead.